Originally founded in 1971 by John Stuart Hague, Hague Fasteners was formed to manufacture high quality fasteners, concentrating on non standard sizes and exotic materials. Manufacturing small to medium quantities of non-standard or special sizes. At the turn of the Millennium, Hague Fasteners Limited, along with their Sister Companies, Richards & Allan (Nuts & Bolts) Ltd & European Breakdown Bolting (EBB Ltd) were consolidated under the single group name, The Ralin Group Ltd. 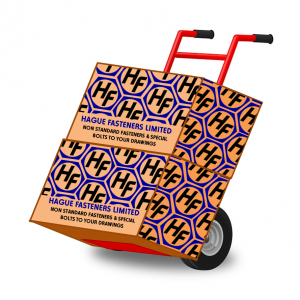 However, being so proud of our tradition and history, the iconic name of Hague Fasteners Limited returned for good in 2010. Hague Fasteners have enjoyed great success in recent years with their wide array of Clients worldwide giving excellent feedback with an unrivalled level of customer service. Hague Fasteners made significant investment in 2017 with the purchase and renovation of their brand new Special Fastener manufacturing centre in the heart of Willenhall, a Black Country town founded on it’s engineering excellence. The exciting move to a brand new, custom refitted facility enabled the doubling of production capacity now sees even faster production times and a continued commitment to reliability. The company is now run by husband and wife team, Jon & Claire Hague, and the business continues to grow as a third generation family business with all three of their sons, Jack, Tom and Max now taking key roles within the Companies operations.